Credit Suisse has always distinguished itself by supporting innovative, high-impact initiatives. It was therefore a logical decision for the bank to support the Laver Cup, a truly pioneering endeavour aimed at celebrating the game of tennis and its heroes, along with a commitment to inspiring future generations of players. The three-day tournament has been embraced by fans worldwide since it began in 2016. It is played on a stylish black court and pits six of the top male tennis players from Europe against six of their counterparts from the rest of the world. 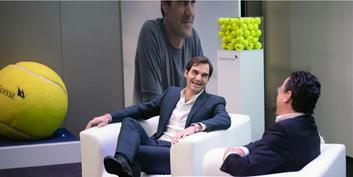 Roger Federer: "Mental strength is one of the most important factors for a successful career"